Two of John Thompsons’ Thompsons! The 1963, 18’4” Super Lancer is named “Big Thom”. 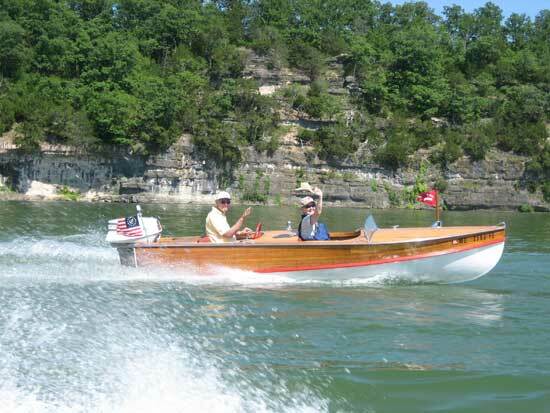 After restoring it, which included new decks, upholstery, reinforced ribs, and paint, she now resides with one of his other Thompsons, “Rescue Thom”. 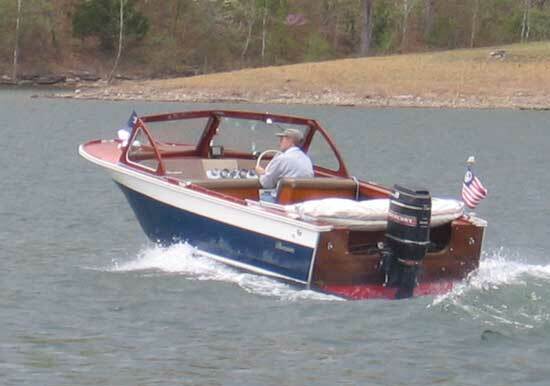 Rescue Thom is a 1953, 16 foot (measured around the gunwale) TVT Super Deluxe, powered by a 1964, 40 horse Evinrude. It was originally a search and rescue boat, retired in 1967, and bought by John in 2005. The trunk was added, as part of tightening up the hull when purchased. Big Thom will do 34 MPH with the 115 horse Merc, and Rescue Thom will clock at 29 MPH.